When you think of a ‘sweet tooth,’ you think of someone who really digs dessert – not dessert that has teeth. 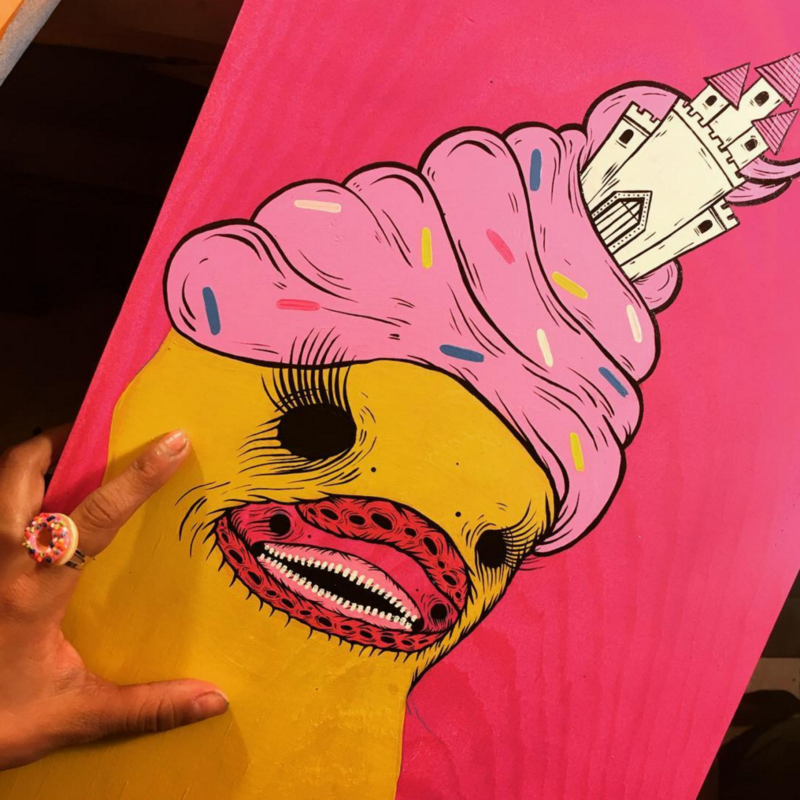 Tatee Garcia – a.k.a “Elloo Elloo” – has combined the morbid with the downright adorably sweet in her murals and art pieces. 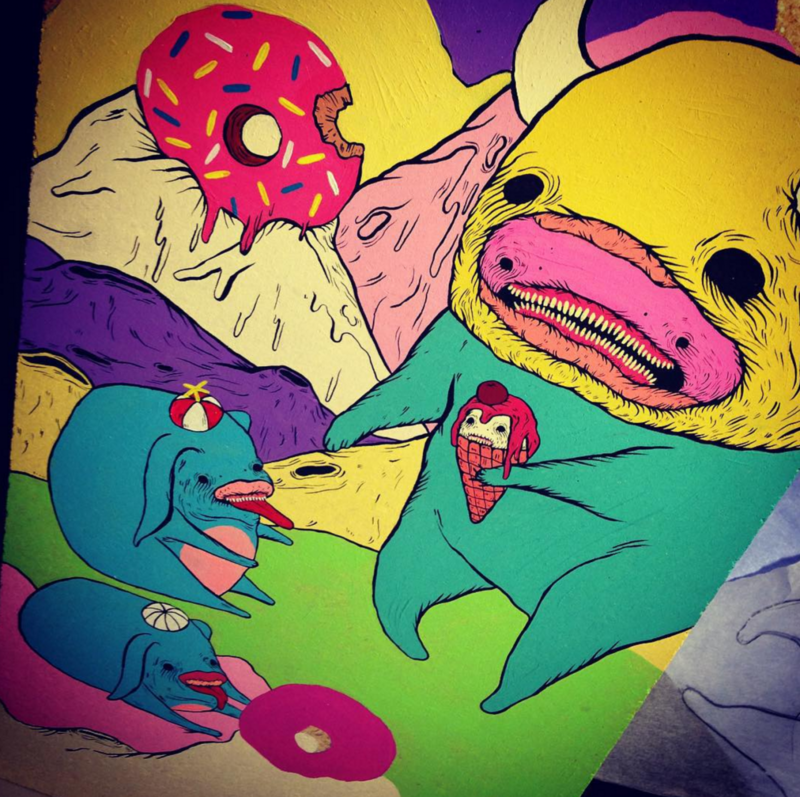 Her distinct style of bright, cotton candy colors and little donut monsters is hard to miss and hard to forget. And we’re super stoked that thanks to the Elloo Elloo Artist Shop, we can now wear her designs all the time. 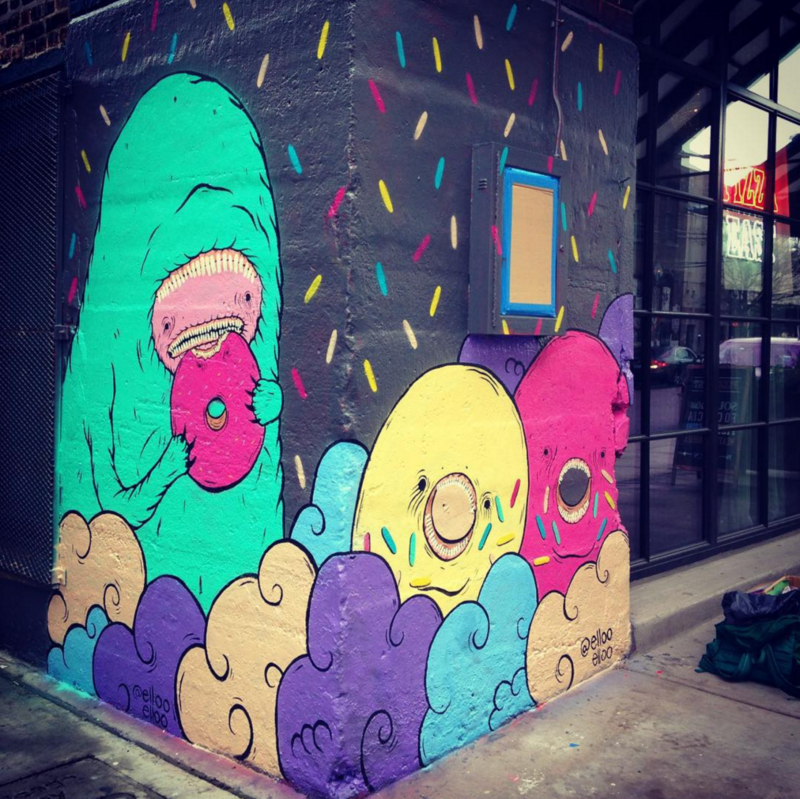 We talked to Tatee about her style, her mural on our new bathroom floor, and where the idea for these *pastries with sweet teeth came from. How did you come up with the name “Elloo Elloo”? ‘Elloo’ (pronounced like ‘hello’) came to me years ago because I was always in love how ‘hello’ sounds in British. I’m a little in love with the ‘evil’ pastries you make. Where did this idea come from? My ‘evil’ pastries, or my babies as I call them, stem from my love for pastries. I have a bad sweet tooth. 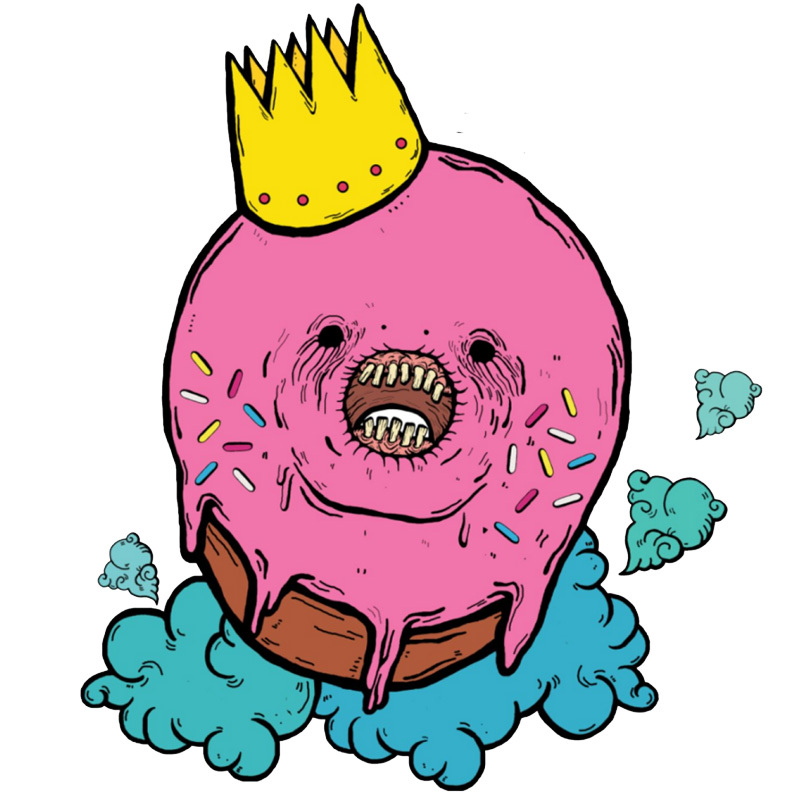 There’s something about donuts that is attractive – the pink frosting is a perfect pink and the sprinkles make it so beautiful. My monsters are usually disguised in bright costumes. I like to define my style as cute and creepy. I use these cotton candy bright colors to give my babies a non-threatening look. I love using lines and I go crazy with it. My style has gone through many stages of development. I remember in the beginning I only used to draw in black and white. I did that for a while until I decided to experiment with color. I was overthinking the whole color process and one day I faced my fears. Started using bright cotton candy colors that brought my babies to life. Since then I rarely use black and white. Now it’s all about the pinks, yellows, aquas, and all that good stuff. I also feel like it makes my creatures more friendly and cute. You just did the art for the ladies bathroom at our new space – is that a pretty unique assignment as far as where you’ve created murals before? Yeah! It was definitely a pretty unique idea! It was the first floor I painted and it took me less than two days. There were some challenges that I faced, like not being able to see the entire image like I would for a wall. Then there was great learning opportunities than challenged my technique and skills, which is always a good thing because it gets me out of my comfort zone. 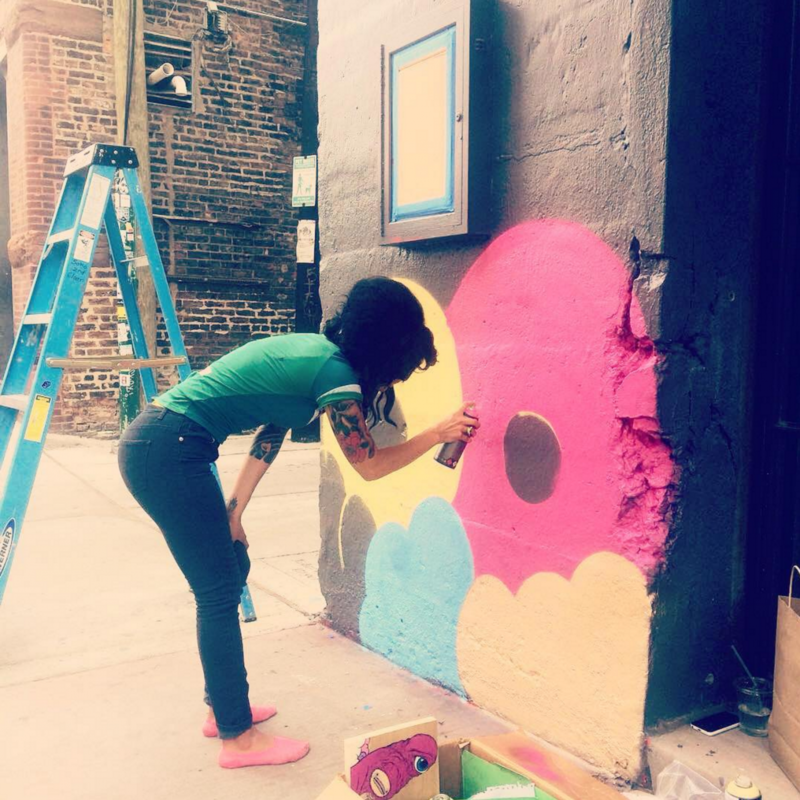 There aren’t a ton of female muralists out there, especially ones with such a unique style – what are some of the challenges of this? What’s rewarding about it? I like to think that the other female artists are hiding out there, waiting for a perfect time to come out. I’ve been working on my craft for a few years and the challenges that arise are finding motivation to keep coming up with new ideas or to work with what I have. Sometimes it helps to have someone (male or female) that has a similar style, to bounce ideas and get me out of my comfort zone. 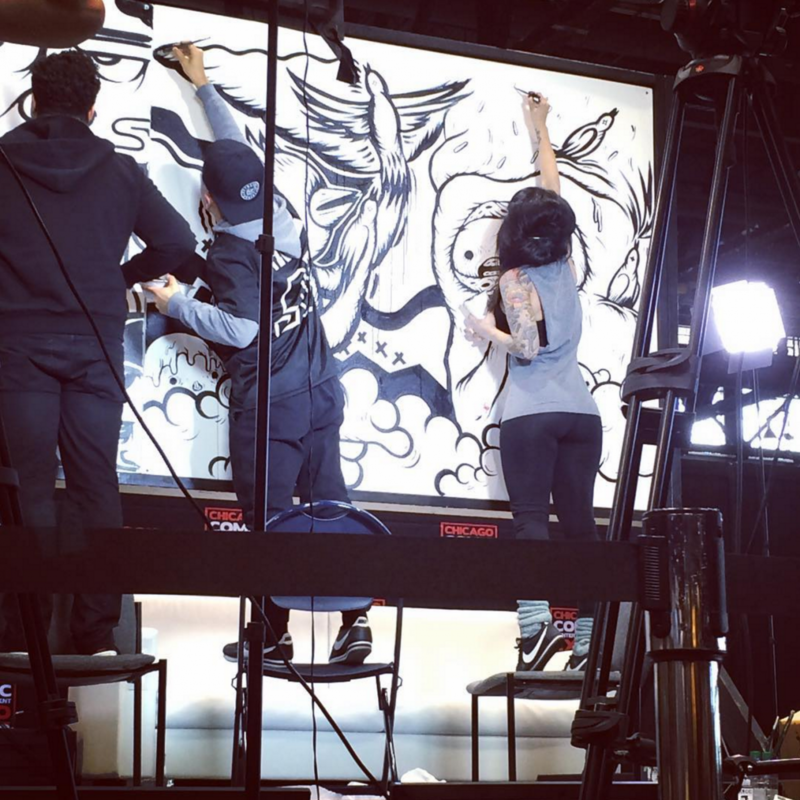 How did you get your start in being a muralist? The first mural I painted happened in Back of the Yards, I was invited by a friend and that pretty much changed my life. There was literally a rainbow in the sky, it was a sign. Since then I have been painting walls and doing all types of painting jobs. It really is a great experience to paint outside and collaborate with people. How long does one typically take? Depending on the size and how ambitious I’m feeling, it can take hours. I’m still working on my speed and I’m a little slow because I haven’t mastered spray paint but I try. I’m still learning so every time I paint I get a little faster. 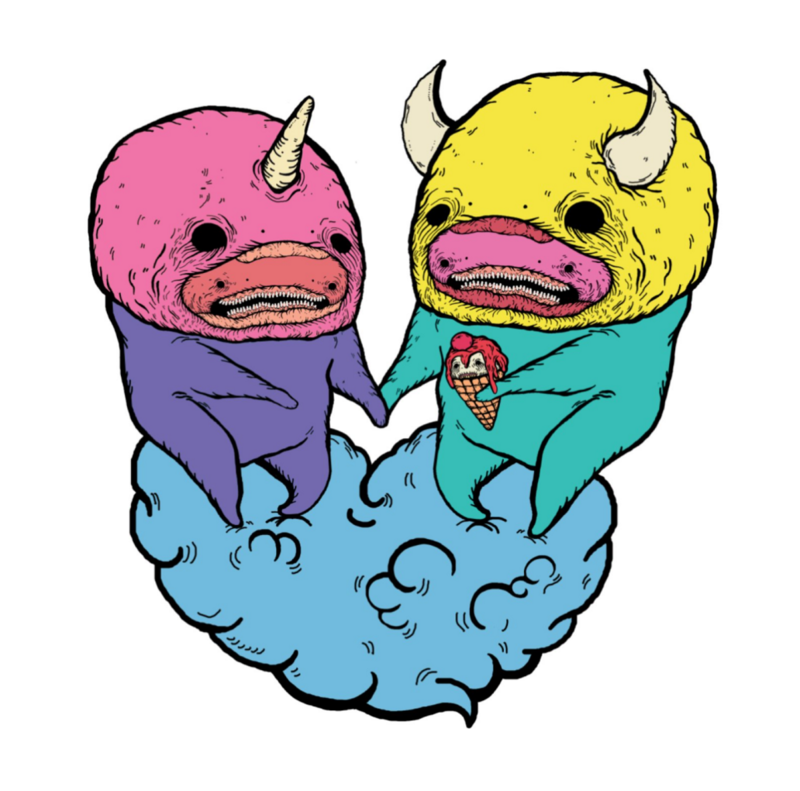 What inspired you to open a Threadless Artist Shop? Have you put your designs on apparel before? Since I was in high school I dreamed about one day having an apparel shop with my own designs. Of course, it was all an idea and after some time I forgot about it and ventured into other things.Now that I have a solid style developed I felt like it was a great opportunity to get something going, hence my EllooElloo artist shop. What do you think attracts people to your designs? 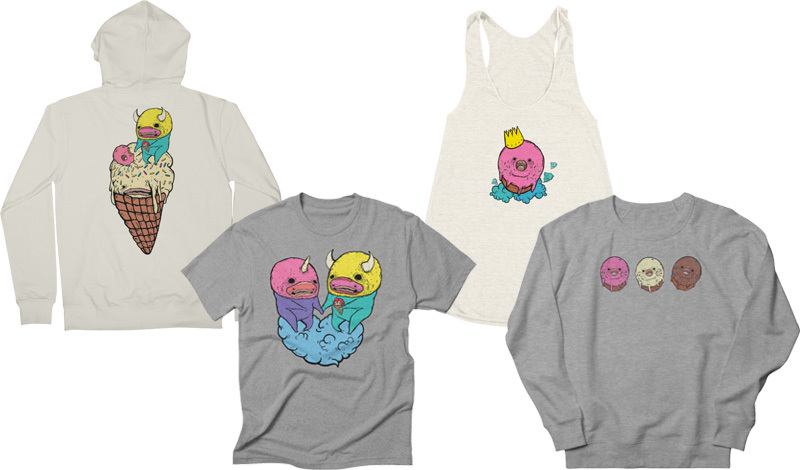 I think that people are attracted to my designs because of the colors and because the monsters are cute, well at least to me. They’re just cute little monsters that just want to love and be loved. You’re involved with After School Matters! Tell me a little about this. What inspired you to get started with the program? I currently work for a non-profit called Green Star Movement that is partnered with After School Matters. We create public art with students and transform public spaces using bricolage. Working with GSM allows me to be around creative, young students. You seem so creative and unabashedly yourself, which is something I think is awesome. What advice would you give to artists trying to find their style or their “thing”? Like anything, practice, practice, and more practice. Style is something that just happened, it was a long process that took me years to develop (it’s still evolving). Trying different mediums and experimenting is also a big thing – it’s a process of seeing what works and what’s going to enhance your work. I started getting into the habit of carrying a sketchbook and doodling during my commutes. It’s a great way to sketch everyday and keep your brain pumping ideas. 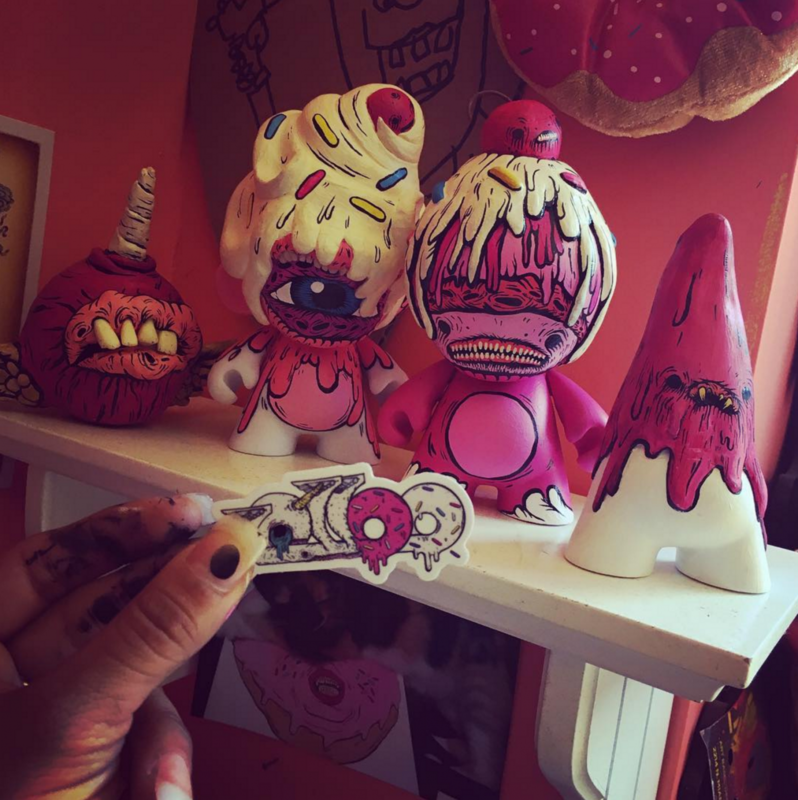 Check Out Elloo Elloo’s Artist Shop Here! 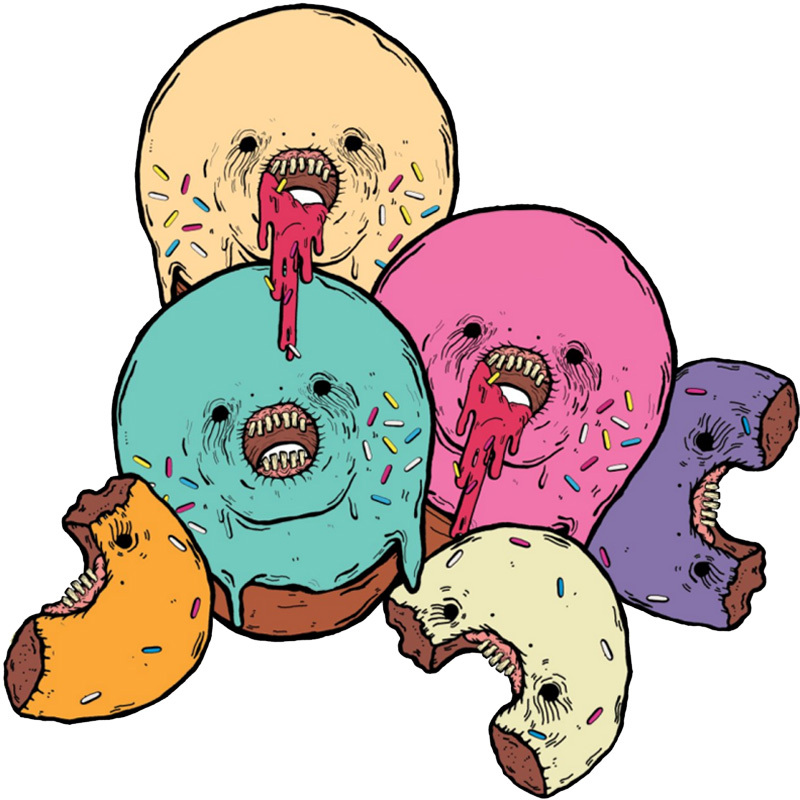 Posted in Spotlights and tagged creepy, cute, donuts, elloo elloo, murals, tatee garcia. Bookmark the permalink.